Simplify: Access all of your web assets in one central location. Simplify your decision making process. Throw out your long list of logins for analytics, forms, call tracking, Craigslist, and Google AdWords. Everything in one place: that is how it should be, and is at Dealer Lab. Asset Integration Reporting: Dealers are overloaded with reports and metrics, and we believe our simplified dashboard and dealer score will resonate with dealers looking for “actionable” insights to their data. Know your conversion rates for all different devices and sources. Google Analytics Integration: Get all of your website’s performance information in one convenient location. Industry standard for tracking metrics related to website usage. 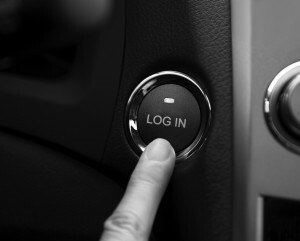 This invaluable tool is integrated directly into the Dealer Lab dashboard giving you access to all data in real time. Leave nothing to mystery with our transparent and fully-integrated analytics. Pay Per Click, Dynamic Ads, and Remarketing Reporting: Using our proven SEM methods, Dealer Lab can ensure that your ads will show to the right customers at the right time; increasing conversions and bringing new customers to your site. Dynamic inventory based advertisements will be generated on the fly, based on your current inventory. Remarketing is one of the most cost effective ways to spread brand awareness among your target market and stay on the customer’s mind throughout every stage of the car buying process. 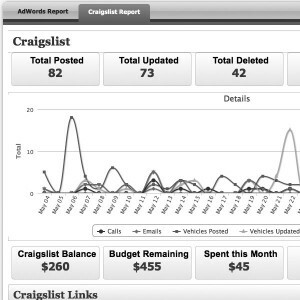 Integrated Craigslist Lead Reporting: Automatically keep your Craigslist posts up-to-date with daily posts of new inventory, pricing updates and deletion of SOLD vehicles, and photo update (when available). Our service is based on your monthly budget, allowing a disciplined approach for dealers, with predictable costs. With full transparency, our reports clearly illustrate your ROI. Lead Management and Tracking: Don’t be left in the dark. With our lead conversion tracking you will know exactly who, what, where, and when you received leads from your website. All lead submissions on the website are recorded with statistics on submissions. Chat Tracking Made Simple: Our advanced chat system lets you easily track past chat customer interactions. You can see website chat statistics and read chat conversations, all in one convenient location. Leading Edge Call Tracking: All phone calls by department are recorded and stored in the Dealer Lab dashboard. We provide tracking phone numbers, and we’re also integrated with companies such as CallBright, WhosCalling, KnowMe, etc. Top Inventory Searches: The Dealer Lab dashboard offers stats and data down to every vehicle you have in stock. Find out which vehicles in your inventory are searched the most. The post One Login For All appeared first on Dealer Lab.